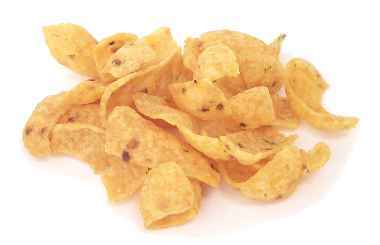 Today is National Corn Chip Day. I can’t say for sure just how many people out there actually celebrate National Corn Chip Day, but it struck me that our favorite brand of corn chips only contains 3 ingredients. Naturally, I thought I could reproduce the flavor of those yummy little chips in time for the big game and no one in the family would be the wiser. mix well until it forms a ball, adding a bit more water as needed. Drop teaspoons of the mix onto a piece of wax paper, don’t even attempt to drop these onto a cookie sheet because they stick to everything and with just break apart when you try to pick them up to fry them. Pres them down a bit to flatten. Fry them until golden brown. Sprinkle with Salt. Or alternatively, if you want to make corn chip leather, you can bake them at 375F for 20 minutes or so. To be fair, I thought these were absolutely terrible, However, the kids thought they were awesome and proceeded to eat a few dozen of them. I figure that the Corn Chip companies out there actually process their corn chips several times, baking and frying, which I also tried. It results in a leathery, dried out, very nasty chip that not even chickens will consume. and then, dear folks, I got a wonderful idea, a wonderfully HORRIBLE idea… I had a box of Jiffy Corn Muffin mix and I thought, for only a moment, that it would work perfectly. So I mixed up a box of jiffy corn muffin mix with a bit of water and corn oil. I tasted the dough- it tasted very similar to our favorite brand of corn chips- then I dropped one into the hot oil and it instantly disappeared. It literally dissolved into a sizzling mess of black. No corn chip- just black crumbles. So, despite the fact that the rest of the family thought these were palatable, I think when I get the craving for Fritos, I’ll alleviate it by buying a bag.